In addition, members or other organizations occasionally sponsor short-term projects and ask for help from the membership. Many OVQG members participate in our ongoing program of providing baby quilts for the premature babies in the Rich Little Special Care Nursery at the Ottawa Civic Hospital. These quilts are used for protecting the tiny babies from the lights and noise of the nursery. The babies take the quilts with them when they finally go home. The Guild collects 300-400 quilts each year. The Baby Quilts Coordinator can help with ideas and patterns. There are also often bags of scraps available at monthly Guild meetings to use in making little quilts. If you have any questions, ask at the table, or email the Baby Quilts Coordinator. 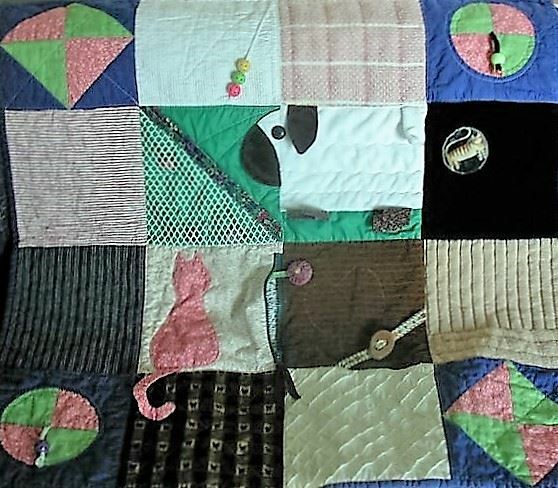 Please drop off completed baby quilts at the Baby Quilts table at monthly Guild meetings. You will receive a chance to win a fat quarter for each quilt you drop off. The OVQG is continuing its longstanding support to Ottawa’s Meals on Wheels program. The beautiful quilted place mats made by our members are delivered by volunteers to approximately 100 very frail and isolated seniors on December 25th, along with a special free meal and goodies provided by Meals on Wheels and other generous donors. Our feedback from the Meals on Wheels organization is that the recipients are thrilled with the special December 25th visit - so meaningful to our local shut-ins. Please continue to create and donate quilted place mats for the Meals on Wheels program. The place mats will be delivered in early December. Size: They should be about 13" x 18", in seasonal or other suitable fabric choices. Please drop off place mats at the Charity Quilts table at the monthly Guild meetings. Note - free batting and backing fabric is available from the Charity Quilts table. Family Services Ottawa runs Anti-Violence programs to enable women to live free from violence and abuse. Children are included in many aspects of these programs. The focus, however, is on the women who have taken steps to leave their abusive situations. OVQG’s beautiful quilts are a focal point in how these women are encouraged to turn their lives around. They have previously lived in isolated disruptive abusive situations. Assisted by the programs run by Family Services Ottawa, the women are in transition to a new home, a fresh start. Our quilts are often amongst the very first treasures that these women own and bring to their new home. When the women complete the Support Group program, they are encouraged to thoughtfully choose the one special quilt that speaks to them. This key decision - the decision to choose their very own quilt - is remarkably empowering to these women. 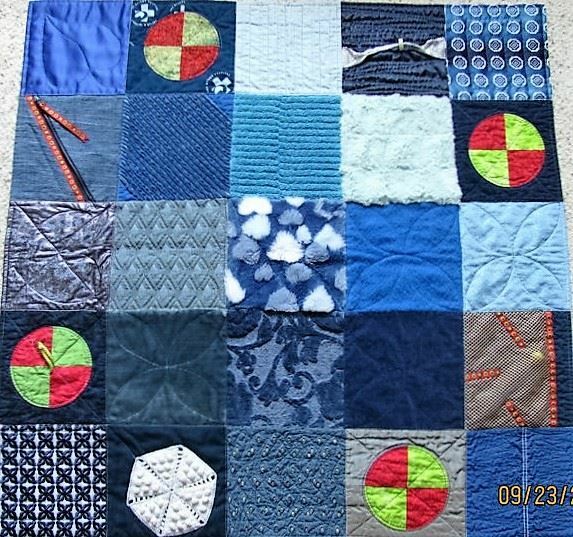 Please continue to support the Anti-Violence programs by making and donating quilts for FSO. The OVQG has traditionally delivered about 40 quilts a year - a big commitment on our part, yes, but these quilts make such a difference in the lives of so many Ottawa women and their children. Size: about 40" x 60" for adults and youths and 30" x 50" for children and babies. Hospice Care Ottawa was formed in 2013 from the Hospice at May Court and Friends of Hospice Ottawa. They are a community-based charitable organization offering services for clients and their loved ones to experience end-of-life care in a supportive and peaceful setting, surrounded by care that reflects a comfortable home environment. Hospice Care Ottawa currently provides services at four sites. OVQG has been requested to provide about 12 lap size quilts for their Day Hospice program. Day Hospice guests often need a warm quilt to feel more comfortable. Size: about 40" x 60"
Colours: Use comforting colours - for example, taupes, browns, forest greens. They have asked us to avoid using whites, pinks and purples. Pick up batting and backing and drop off quilts at the Charity Quilts table at the monthly Guild meetings. The guild gives touch quilts to Alzheimer patients at a number of long terms institutions around town. Touch Quilts are lap quilts whose most salient feature is the texture of the fabrics. Each fabric piece or embellishment is unique, with a texture different from all other items on the quilt: smooth, fuzzy, rough, soft, harsh, bumpy, ridged, etc. The quilts help to calm people in late-stage Alzheimer’s. They also help developmentally challenged people and autistic children. Embellishments may further enrich the quilt’s feel and provide something to pull, push or move about: a zipper to pull back and forth, a pocket flap to open and close, a bead to tug at, a row of tassels or a ruffle to feel. These attachments require much attention when making a quilt, as they must be affixed so securely that pulling, twisting and even chewing will not remove them. Because Alzheimer patients may “mistake” a bead or button for candy and then choke on it, institutions cannot take the risk that hard embellishments pose. Hard objects also pose a threat to staff and other patients if the quilt is thrown or snapped in anger (having dementia is very frustrating). Therefore, no object should be attached to a quilt that you would not want hitting you in the face if the quilt were snapped at you. Bright, contrasting colours make the quilts attractive to the eye, as well. Alzheimer’s patients, even those with impaired visual acuity, are drawn to cheerful colours and have as wide a spectrum of “favourite colours” as other people. The exception is black, which Alzheimer patients tend to see as a hole. Some institutions may have restrictions: for example, a local nursing home indicates no-go areas with yellow so for that setting yellow would be used sparingly. When making a Touch Quilt think about the needs of the Alzheimer patient: make sure it has lots of excitement for fingers. Make it strong and safe, so nothing will come off and choke a patient, nothing will harm someone whipped by a quilt, and so it will stand up to patient abuse and harsh washing. 1. Wash all fabrics and embellishments for top, back and, if using, middle (except batting). This step is necessary to control shrinkage in the finished quilt. 2. Cut square blocks; 5" to 6" finished is a good size. Accurate cutting is important. 3. Lay the squares out in rows to make a square quilt. 4. Add embellishments to middle of quilt. 5. Sew the squares of each row together. Seams should be sewn 1/4 inch from edge of the fabric. NOTE: Classes are offered through the Guild for which all supplies are provided. If you are wanting to make touch quilts on your own, then supply kits/instructions are available by emailing the Touch Quilt coordinator. Finished quilts can be dropped off at the Guild's Charity Quilts table at the monthly meetings or turned over to the Touch Quilt Coordinator (Jane Roszell) by contacting her directly. These quilts are then passed on to a number of long term institutions around town.